To those of you whom may not have read or heard the story: The White Horse was located in one of the nicer historical buildings along the former Ward Road. 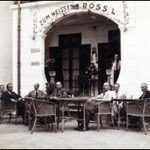 The White Horse Cafe was owned by the Mosberg/Klinger family (now residing in Sydney) and was one of the famous and lively cafes of Shanghai’s “little Vienna” in the early 1940s. 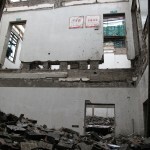 In early 2009 the Hongkou District government decided to widen the street that was home to this building along with many other historical buildings that were marked to be destroyed. 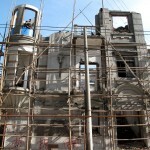 With the hope to preserve these historical sites I contacted few members of the foreign press in Shanghai/China. NPR’s Louisa Lim brought to the area Prof. Ruan Yi Shan from TongJi Univ. that offered in the past the plans for preservation of that area.While the story about the Historical cafe facing demolition made news in the US Radio, Prof. Ruan pitched the story to some of his friends at the local newspapers whom as well ran the story and made public to the issue. 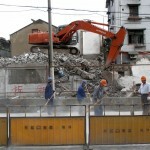 So RIP to another part of Shanghai’s heritage and a great building! The destruction continues unabated and in remorseless fashion – left is a picture of the White Horse Cafe in its heyday. 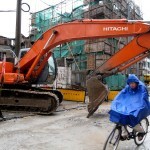 A real pity and something I think all of us in shanghai have come familiar with.in some cases I understand where old buildings have to go, but in maNy cased it is really disappointing.I pass by maoming Lu/Nanjing Lu most days and half of that amazing street is also due to go. Very sad.